But the exuberant country set dances that had taken an hour or more to run their course were well and truly a thing of the past. Taking their place were short, sharp displays where choreographic skill would be judged formally, leading ultimately - under a system initiated by the English Folk Dance Society - to points, medals and certificates being awarded to those deemed worthy. Yet another form of rural working-class expression had succumbed to urban middle-class sensibilities. One of the best known and respected morris dance musicians in west Oxfordshire during the middle decades of the nineteenth century was John Potter, of Sutton, a village adjacent to Stanton Harcourt. He was renowned over a wide area for playing the instrumental combination of three-holed pipe and tabor drum. Joseph Goodlake, a member of the Stanton Harcourt Morris set, who had danced to his playing, commented that Potter 'could almost make un speak'. 14 He was also proficient on the fiddle, which he played in a variety of musical contexts, and these will be examined in greater detail in this piece. His father, William Potter, was baptised in Charlbury, Oxfordshire, on 9 March 1793, although his parents, John and Jane, were evidently only temporary residents, as the register gives the note, 'belongg [sic] to Brighthampton', a dozen miles due south. When he married Elizabeth Foster of Stanton Harcourt on 29 January 1810, William was residing at nearby Northmoor, two miles south of that village. John Potter was their second child, baptised 12 September 1813, and on four occasions between that date and 1823, William is noted as 'labourer of Sutton'. The census of 1841 confirms his occupation as agricultural labourer, and his place of residence as Duck End (presumably Ducklington End), Sutton. The 1841 census listed only the occupation of the head of the household, so that John Potter's mode of employment at this date is not recorded. But he was still living with his father and sister Elizabeth. Four doors away (assuming the enumerator followed a logical perambulation through the village) lived the family of George and Charlotte Goodlake. His occupation was given as 'Grocer &c'. Joseph Goodlake, already noted as one of the Stanton Harcourt dancers, was one of their children, born 8 May 1836. Clearly there was a close relationship between the two families, and it seems likely that through this association Potter became a carrier and shopkeeper in his own right. George Goodlake had himself risen through the social ranks. At the baptism of seven children between 1820 and 1831 his occupation is given as labourer. By 1833, and again in 1835 and 1838, he is a baker. In both 1836 and 1840 he is described as shopkeeper. And at the baptism of his thirteenth, and final, child in 1842, a publican; while at the date of a daughter's wedding in 1844 he is noted as victualler. Following his death in 1846, his widow Charlotte maintained the shop until 1853, at least. Although I have been unable to discover where and at what date Potter married Alice Mitchel, of Wytham, Berkshire, this would have taken place prior to September 1845, when their only child was baptised. In the register he is given as 'Carrier of Sutton'. Between that date and 1875, at least, he appeared regularly in published trades directories in his twin roles of shopkeeper and carrier. For much of this period his weekly schedule was consistent. On Wednesday and Saturday he would leave Sutton at seven in the morning to travel to a designated public house in the centre of Oxford City, returning around three thirty in the afternoon. The River Thames lay between and because the only convenient crossing was over the toll bridge at Swinford, the round trip was about twenty two miles. And at nine on Thursday mornings he would make the much shorter trip - about seven miles there and back - to another public house in Witney. At some point between 1867 and 1875 he had added a regular Monday journey to Abingdon, a total return trip (again avoiding the river) of just over twenty miles. A carrier needed to run a reliable service, and if that was not maintained there was always a rival in Sutton to take up the slack. These journeys were, therefore, made in all weathers: sunshine, rain and snow. Speaking posthumously of his father-in-law in 1892, Maximillian Charles 'Maxey' Mitchell observed that he was 'always a strong man', but 'always suffered with the cold', 15 exacerbated, no doubt, by frequent seasonal travel in adverse weather conditions. Mitchell (himself a carrier and perhaps speaking from personal experience) added, 'When he was a carrier he used to drink', which is hardly surprising given that three, and later four days a week he had time to kill while waiting to make the journey home, and this would often be spent in the vicinity of a beer retailer. In a previous instalment in this series I suggested that Edward Butler may have acted as musician for the challenge match held about 1854 at The White Hart in Minster Lovell, at which morris sides from Standlake, Ducklington, Brizenorton, Bampton and Leafield competed for supremacy. 19 Equally as likely a candidate - perhaps more so, given that he is elsewhere confirmed as having played for four of the five teams - is Potter himself. In his manuscript history of the morris tradition at Bampton, Oxfordshire, dated January 1914, William Nathan 'Jingy' Wells, himself a fiddle player, lists successive musicians who had played to the Bampton set from about 1840. This includes Potter, but implies that he was involved there for merely two or three years. These details came to Wells via his uncles Henry Radband (born 1836) and James Portlock (circa 1839). Although Wells claimed in January 1914 that Radband had 'taken part 56 years', 21 fixing a date for primary public performance at 1858, by July that same year Radband was claiming activity stretching across 'sixty years', 22 positing a date of 1855. If the latter date is accurate, Radband would have danced in a set for which Potter played. Similarly, if Portlock conformed to the standard lower age limit for joining a dance set at eighteen or twenty, he may also have danced to Potter's playing. In any case, both were steeped in morris dance lore through family tradition. Radband's grandfather, Thomas Radband (born 1776), had been leader of the Morris side until his death in 1854; while Portlock's older brother William (born 1830) had, logically, preceded him into the performing set. But for performance accompanied by the 'orthodox' music he needed to look no farther back in time than the previous year, when, implicitly, John Potter had been out perambulating the town with the dancers. In 1914 Wells explicitly identifies Potter as having been from Stanton Harcourt and places him in the list of pipe and tabor players. At a later date, however, his memories apparently became more confused. In a letter published in 1937 he mentions 'old Potter from Ducklington'. 24 Perhaps around the same date, but certainly prior to his death in 1953, he related some of the morris history to his friend W A D Morris, who subsequently committed a portion of it to print. Among those stories was one relating to Potter. Wells would almost certainly have thought of pipe and tabor as a single instrumental combination, while Potter is known to have also played the fiddle. What the remaining two instruments might have been, however, is unrecorded. There is a suggestion that Potter possessed tune books, which passed to Percy Manning via 'Maxey' Mitchell, 27 and he may therefore have been involved with a band of some description. And although there is apparently no evidence, it would be surprising if Potter had not fulfilled the common role of numerous other musicians based in the countryside, providing music for social dancing, harvest suppers, and the like. Much of this recorded evidence for activity with various morris dance sets appears to relate to the period around the eighteen fifties. Within a decade of 1860 the custom had been abandoned in the vast majority of communities, and the opportunities for employment among musicians seriously curtailed. But if the disappearance of the morris tradition had effected a shift in lifestyle for Potter, especially during the Whitsuntide period, his circumstances were entirely transformed following the death of his wife in September 1878. Between that date and 1880 John moved away from his home village to live in St. Ebbe, a densely populated area a little over a quarter of a mile square, in the heart of Oxford City. 30 A more dramatic change in living conditions, from the open countryside of the Thames Valley to closely-packed and gardenless terraces, can scarcely be imagined. His place of residence in 1880 was 31 Penson's Gardens. 31 It seems likely that his relocation had been facilitated by a friend already living in that parish. The most likely scenario involves the assistance of Thomas Goodlake, a son of George and Charlotte, brother of the Morris dancer Joseph, and (on no evidence whatsoever) possibly himself one of the dancers. As a youth he had been Potter's neighbour back in Sutton. Now aged 51, he was was a 'sugar boiler and confectioner' living at 21 St. Ebbe Street, having been resident in Oxford City for at least fourteen years. When the national census was taken in early April of the following year, the house at 31 Penson's Gardens was occupied by the family of one William Potter, aged 36 and born in Reading, Berkshire, who just possibly was a relative. John Potter had moved three doors away to number 28, and was living in The Gardeners Arms public house. At this date, Potter's mode of employment was given as carpenter. Perhaps significantly, in 1880 Augustus Rockall, carpenter and joiner, lived next door to Potter, at number 30. But more importantly for his musical inclinations was his proximity to the chimney sweep John Hathaway (then aged twenty four), a mere two hundred yards distant, at 45 Friars Wharf. Also within the same dense network of houses, just round the corner from Penson's Gardens, at 16 Bridge Street, lived Henry Taunt, father of noted photographer Henry W Taunt, who immortalised a number of traditional customs on film, including the morris dance teams at Chipping Campden and Bidford (both in 1896), and Headington Quarry in 1899. 32 The younger Taunt had himself been born in St. Ebbe, in 1842, and would have been well acquainted with the Hathaway family. By early April 1881 he lived at 9-10 Broad Street, less than half a mile distant, where as a successful businessman he employed eleven men, four women and seven boys in his photographic shop. It was here that he resided when the Hathaway family of chimney sweeps decided to revive one of the old customs long associated with their trade. Roy Judge has analysed this connection of May Day with the sweeps in some depth, and in his published volume 35 details the increasingly elaborate costuming of the participants. One character which assumed a central role in the custom from the early years of the nineteenth century was that of 'Jack in the green', consisting of a man encased from head to ankle in foliage and spring flowers. This is convincing, if late, evidence of Potter's involvement, but at a much earlier date, in the manuscript of Percy Manning, there is circumstantial evidence to suggest that Potter had indeed been the fiddle player on this occasion. Adjacent to material collected from 'Maxey' Mitchell is the note, 'Taunt's photo taken 1886'. 43 And, of course, he was on hand at exactly the time the services of a musician were required. Evidently time and sensibility had been ripe for a revival of the 'Jack' ceremony, and the opportunity seized. The majority of customs require advance planning, a sufficient number of participants for enactment, suitable costuming and accessories if deemed appropriate, and a musician where required. All these factors fell into place during the early months of 1886, and while both the actual form taken by the custom and the circumstances surrounding its revival demand a more detailed analysis, a brief rehearsal seems appropriate. Sufficient personnel had by this date become available for a revival of the 'Jack' custom. The strong back needed to carry the heavy framework of foliage was found in John Hathaway, then aged twenty nine and physically active, as chimney sweep in 1881 and (taking over his father's trade) horse slaughterer ten years later. Members of the Bensley family, long resident in the City, assumed three of the roles. Robert Bensley (aged forty two in 1886, a bricklayer in 1891) acted as 'Lord of Misrule', an archaic term adopted in early 1886 by D'Arcy Ferris to describe his own role within the Bidford Morris revival, and one obviously mentally associated with Bensley by Fred Taphouse. The fool, 'H Bensley', may be identified as Robert's son Henry, then aged nineteen and a 'General Labourer' in 1891. Lewis Bensley, as yet unlocated in the official sources, is most likely to have been yet another of Robert's sons. Of the two money collectors A and R Hathaway, the former also remains unidentified, but the latter is almost certainly Richard (then aged twenty four and in 1881 a 'Labourer (Carter)', presumably working for his carrier father), a younger brother of John, the man inside the 'Jack'. The remaining accoutrements were relatively common: shovel and poker (signifying the long-established association of May Day with the sweeps), a ladle, an inflated bladder (quite probably from one of the slaughtered horses which were the stock in trade of John Hathaway senior), and three collecting boxes, which appear to have been hand-crafted by an experienced carpenter. And, finally, John Potter, with his vast store of tunes and extensive experience of playing for dancing (not to mention his skill as a carpenter), was living almost on the doorstep. 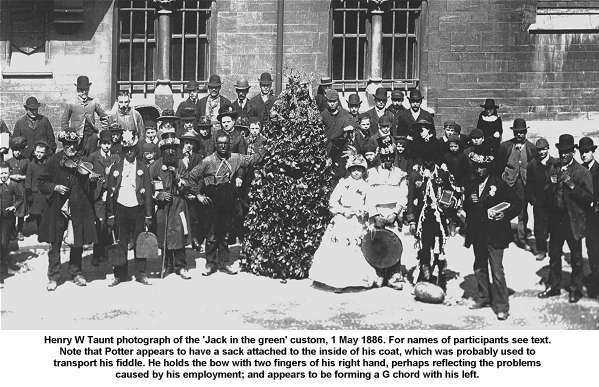 The following May Day apparently saw no appearance of the 'Jack', 47 but it resurfaced in 1888, once again accompanied by 'an ancient-looking fiddler'; John Potter without a doubt. The following year, 1889, the custom was conspicuous by its absence, 49 but reappeared yet again in 1890. Although two of the three brief accounts note that dancing occurred 50 none make mention on this occasion of the musical accompaniment. By this date Potter had moved back into St. Ebbe, and was living at 3 Johnson's Yard, off Blackfriars Road 51 1891 is the final year that he could possibly have been involved with the 'Jack', but although reports of May Day occurrences are given in two of the City newspapers, neither mention the custom. Eight weeks before May Day of the following year he was dead. The circumstances surrounding Potter's final hours on earth were given at a coroner's inquest, held on 11 March 1892. 'Maxey' Mitchell gave evidence of how he came to find the body of his father-in-law two days later, incidentally revealing several otherwise unrecorded facets of Potter's life and character. Additional observations included the fact that Potter's bedroom 'presented a most neglected appearance', 54 and that at the time of death there had been 'plenty of food in the house.' 55 The coroner's jury returned a verdict of death from exhaustion from old age. Potter's 'awkward' mode of walking is likely to have been a result of half a lifetime of travelling in an open carrier's cart in all weathers, resulting perhaps in rheumatism or arthritis. His clumsiness with his hands would have additionally been exacerbated by years of carpentry work. And yet, even in the week prior to his death, he was still able to play the fiddle in various public houses, including The Balloon, a few hundred yards from his home. Mitchell comments that he had seen Potter 'frequently lately.' In his role as carrier living in Botley, two miles to the west of Oxford City, he made the journey there and back daily, 56 and would thus have had ample opportunity to visit his father-in-law. Although he observes that Potter had done 'nothing much of late' in the way of work, on the day of his death he appears to have been employed at Mr. Ward's wharf on Fisher Row, beside the canal. Potter's importance to the social, commercial and cultural life of the area between Oxford City and the border with Gloucestershire to the west was extensive. For more than three decades he travelled out and back from Sutton to Oxford and Witney three days a week (later adding a trip to Abingdon on Mondays), carrying goods and passengers to those market towns. His shop in Sutton itself sold provisions to keep body and soul together and would, in common with most country shops of the era, have acted as a focal point for meeting friends and exchanging gossip. We may observe, however, that his was a life more commercialised, more monetary-biased, and his status elevated far above his labouring peers. Even in times of widespread general dearth, such as occurred during the Crimea War of the middle eighteen fifties, he is unlikely to have wanted for at least the basics. And yet, although his various enterprises took him many thousands of miles, Potter's whole life appears to have been played out within a fifteen mile radius of his birthplace. His musical talents were utilised by more than a dozen separate morris dance sets on numerous occasions, and he also provided music in various further contexts. His great skill on several musical instruments provided entertainment for untold thousands, even to within a few days of his death, during a career spanning perhaps six decades. Note: in the first Census of 1841, the figures for age are notoriously inaccurate, having been rounded up or down by five years, indiscriminately! Note: The 1871 census entry for Potter is confusing, as it gives his occupation as 'do', generally meaning 'as above'. The previous entry is 'Agricultural labourer', but this is evidently an error, for Alice Potter is noted as 'Grocers', a convention used for females to indicate their status as a wife. So, the actual entry was clearly intended to record Potter's status as a grocer, a role confirmed by the trades directories. For further exposition on the role of musicians in a morris dance context see my 'Ribbons, Bells and Squeaking Fiddles' The Social History of Morris Dancing in the English South Midlands, 1660-1900 (Enfield Lock: Hisarlik Press, for the Folklore Society, 1993), Chapter 9. By the time I began serious research in the area, in 1978, it was too late to uncover any significant information on John Potter. In 1981 the second wife of Jim Evans in Eynsham (his father played for the Eynsham Morris), who was a native of Stanton Harcourt, told me that she remembered her mother speaking of John Potter, but could recall no details. 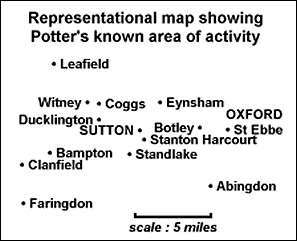 On 19 September 1986 I telephoned the only Potter still listed in the Phone Book for the area around Stanton Harcourt, but she and her husband were neither related to, or knew anything about John Potter. And on 15 February 1991 I rang the only Mitchell still listed for Cumnor, but this was no relation to 'Maxey' Mitchell. 1 - Banbury Advertiser 30 July 1863, page 4. 2 - Dorothy G M Davison, The Story of Swalcliffe (Banbury: Cheney and sons, no date [but Preface dated May 1943]), pages 25-26. 3 - MSS. Diary of Richard Heritage, Marsh Gibbon, Buckinghamshire, covering the years 1821-23, 1826-35, and 1846-65. Currently in the private collection of a descendant, there are extracts in the author's collection. 4 - Oxford Times 9 May 1863, page 6. 5 - Buckingham Express 30 May 1865, page 5. 6 - Buckingham Express 6 June 1874, page 4. 7 - Buckingham Express 11 June 1881, page 5. 8 - Buckingham Express 3 June 1882, page 4. 9 - Kelly's Oxford Directory with Abingdon, Woodstock and Neighbourhood for 1890-1 (London: Kelly & Co., 1890). 10 - Buckingham Express 10 June 1882, page 5. 11 - Buckingham Express 7 June 1873, page 4. 12 - "The Old Stable Jacket. Traditions of Gloucestershire. Volume 1," Folktracks cassette FSA-45-415 [first published 1978]: tape-recorded interview with Bill Williams, Gloucester, by Peter Kennedy, 1957. Transcribed by the present author. 13 - Faringdon Advertiser, 22 June 1912, page 4. 14 - Percy Manning MSS., Bodleian Library, Top.Oxon d.200, folios 237-239, interview with Joseph Goodlake, Yarnton, Oxfordshire, March 1901. 15 - Oxford Times 19 March 1892, page 5. 16 - Manning MSS., op.cit., folio 73, notes by Thomas J. Carter from an interview with [Maximillian Charles] 'Maxey' Mitchell, Tumbledown Dicks, Cumnor, Berkshire, no date . 17 - Ibid., folio 175, notes by Carter from an interview with John Bennett, Ducklington, 19 March 1895. 18 - See my Morris Dancing at Ducklington (Minster Lovell: author, 1984); or the later revision as 'Morris Dancing at Ducklington', Oxfordshire Local History 4, number 1 (Autumn 1992), pages 1-15. For a summarised chronology of performance see my Morris Dancing in the English South Midlands, 1660-1900. A Chronological Gazetteer (Enfield Lock: Hisarlik Press, for the Folklore Society, 1993), pages 155-158. 19 - Manning MSS., op.cit., folio 227, notes by Carter from an interview with Jonathan Williams, Leafield, September 1894. 20 - William Nathan Wells MSS., 'Written by W. Wells, on Morris Dancing', January 1914 [now lost]. Transcribed by Roy L. Dommett, with a copy in the author's collection. 22 - Reading Standard 25 July 1914, page 9. 23 - Jackson's Oxford Journal 29 May 1858, page 8. 24 - 'Dance musicians,' English Dance and Song 1, no. 5 (April 1937), pages 70-71. 25 - W A D Morris, 'We be the 'riginals', Witney Gazette 19 April 1968, page 9. 27 - Manning MSS., op.cit., folio 69. 29 - Letter from Roy L. Dommett, English Dance and Song (Summer 1969), page 70. 30 - In 1881, St. Ebbe consisted of 1092 inhabited houses, 37 uninhabited, and 5 being built. The total population was 5297 persons, of which 2582 were male. By 1891 the same number of houses were inhabited, but there was a higher number uninhabited (54). The population had fallen a little, to 4964, of which 2442 were male. 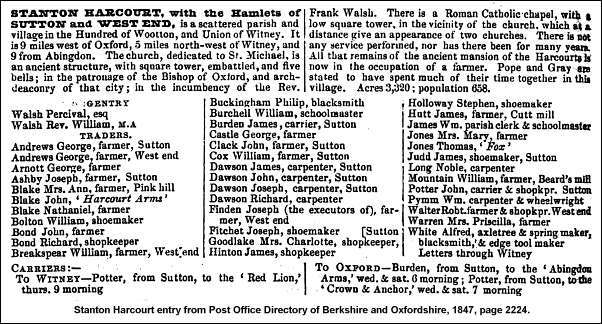 31 - Oxford Post-Office Directory for 1880 (Oxford: J.C. Valters, 1880), page 61. 32 - For Campden see my 'The Archival Morris Photographs - 2: Campden Morrice Dancers, Chipping Campden, Gloucestershire, 1896', English Dance and Song 46, number 3 (Autumn/Winter 1984), pages 6-8; and for Headington Quarry see Bob [Robert W.] Grant, Mike Heaney and Roy Judge, "Copy of gp Morice Dancers Mr Manning," English Dance and Song 43, number 2 (1981), pages 14-16. 33 - For his playing activities see Oxford Times 19 March 1892, page 5. For a map showing the distribution of public houses see Carole Newbigging, The Changing Faces of St. Ebbe's and St. Thomas, Book Two (Witney: Robert Boyd, 1997), page 42. 34 - The Oxford Post-Office Directory 1884-1885 (Oxford: J.C. Valters, 1884), page 48. 35 - Roy Judge, The Jack-in-the-Green. A May Day Custom, 2nd edition (London: FLS Books, 2000). 36 - Jackson's Oxford Journal 14 June 1862, page 8. 37 - Jackson's Oxford Journal 3 May 1884, page 5; and 2 May 1885, page 5. 38 - Oxford Times 2 May 1885, page 5. 39 - Jackson's Oxford Journal 8 May 1886, page 5. 40 - Oxford Times 8 May 1886, page 5. 41 - The facade of 9-10 remains close to its appearance from more than a century earlier, when it was depicted in one of the local directories. It is now a branch of Oxford Campus Stores. The facade of Balliol College, as depicted on the photograph, is likewise all but unchanged. 42 - Oxford Mail 1 May 1969, page 6. 43 - Manning MSS., op.cit., folio 69. 44 - Roy Judge, 'D'Arcy Ferris and the Bidford Morris', Folk Music Journal 4, number 5 (1984), pages 443-480 (especially pages 471-474). 45 - 'Reviving Merrie England: May-Day Ceremonies. Specially Described for The Sphere by Henry W. Taunt,' The Sphere 2 May 1908, supplement; quoted in Judge, The Jack-in-the-Green, page 167. 47 - Oxford Times 7 May 1887, page 5. 48 - Jackson's Oxford Journal 5 May 1888, page 5; see also Oxford Times 5 May 1888, page 5. 49 - Jackson's Oxford Journal 4 May 1889, page 5; Oxford Times 4 May 1889, page 5. 50 - Jackson's Oxford Journal 3 May 1890, page 5; Oxford Chronicle 3 May 1890, page 8; Oxford Times 3 May 1890, page 5. 51 - Kelly's Oxford Directory with Abingdon, Woodstock and Neighbourhood for 1890-1 (London: Kelly & Co., 1890), page 112. 52 - Oxford Times 19 March 1892, page 5. 54 - Oxford Times 12 March 1892, page 5. 55 - Oxford Times 19 March 1892, page 5. 56 - Kelly's Oxford Directory with Abingdon, Woodstock and Neighbourhood for 1890-1 (London: Kelly & Co., 1890), page 318. With thanks to Malcolm Graham and his staff at The Centre for Oxfordshire Studies, Oxford Library, Westgate, Oxford; Roy Judge; Mike Heaney. Transcripts of Crown-copyright records in the Public Record Office appear by permission of the Controller of HM Stationary Office.